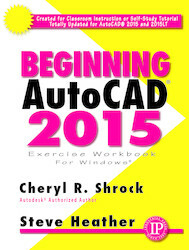 Beginning AutoCAD 2015 Exercise Workbook by Cheryl Shrock and Steve Heather is the right book for users if they’re new to AutoCAD or want to brush up on the basics, they’re looking for a clear, no nonsense, easy-to-follow text, or they want to learn AutoCAD quickly and easily. All exercises print easily on a standard 8 ½” x 11” printer. The “New Tab” page containing two sliding content frames, Learn and Create, enabling you to quickly access recent drawing files, templates, product updates and online resources. Also see the author's Advanced AutoCAD 2015 Exercise Workbook.